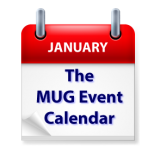 The first MUG Event Calendar of 2018 gets the year started with some diverse topics. A Missouri group will discuss iCloud, a Connecticut group will look at artificial intelligence, and Slack will be the featured topic at a Nevada group. Your group’s events could appear on The MUG Event Calendar if you make a little effort. Put a note on your schedule for the first of the month and email the details of your next meeting to The MUG Center.